Discussion in 'Deva (US30)' started by King Lucian, Apr 4, 2018. Yes I am fair or at least try to be but I will make this very clear, (I am in no way calling anyone a cheater, lets make that clear first) I will not let anyone cheat on this server. I am a firm believer that you can win without having to cheat. I second this. We joke and have fun with ya'll but at the end of the day if you're caught cheating you WILL suffer the consequences. We can have fun and follow the rules. What's so important that you have to cheat? Honestly, does one have to win so badly to sink so low? And as a disclaimer: I'm not calling out anyone. That's just the way it is cause Kiki and I demand it! Beat me? HAHAHAHAHA Is that what you think happened??? Oh lord.. you must have drank too much of the RIP koolaid while you were on Deva. I hear it can cause delusions of grandeur. You only started attacking me the VERY DAY I disbanded LIT and deleted my acct. I was no longer able to access it (only my coplay was for a few days) before it was closed permanently. I literally never moved a single troop against you lol. Did you not notice the complete inactivity while you were taking the villages? Or did you actually think you were just that good? lol. You probably did. And Im glad you came back on Deva too. It was quite possibly the lamest most boring world to date and you joined the biggest joke of a tribe that has ever existed in TW2. Seems fitting. If you ever do grow a pair though and decide to come back and play without cheating be sure to let me know next time.. Id be happy to give you a lesson in how the talented players do it. You may have thought you were once something in this game... but you're just a has been now. No one here remembers you or cares who you were. Today you're just another rank n file Management hater. So grab a number and get in line son.. cause I got a lot of scrubs to smash before I can get to you. He is clearly one of the players from back in the days when everyone was cheating...I know people who did the same. He openly and happily admits to it here because he knows you can't do anything. And lets face it.. cheating still goes unchecked everyday in this game. You two may do your best to curb it, but the system for detecting cheating is just broken. It' not your fault for not being able to police it. But I agree beez... it takes a very insecure person to feel the need to cheat in a game like this. Then it's always those same players who come on here and pound their chests as if they've accomplished something lol. It's just sad..
cokky! Don't encourage it! I've almost got all of them to hug and make up! Gentlemen, this is the recent development and predictions thread. Topic boys. Cool yourselves. I heard popcorn and a new type of jerry springer show is going on here..... where is my popcorn!!!!!!!!! Gentlemen, this is the recent development and predictions thread. Topic boys. Cool your raging hormones. Beat me? HAHAHAHAHA Is that what you think happened??? i dont think I know...who won again btw?? Oh lord.. you must have drank too much of the RIP koolaid while you were on Deva. You only started attacking me the VERY DAY I disbanded LIT and deleted my acct. I was no longer able to access it (only my coplay was for a few days) before it was closed permanently. I started to attack you and took 4 of your villages and THEN you disbaned lit and quit...not before not during but after!! you also co played several accounts at the same time and moved troops in a syncronized fashion.. I literally never moved a single troop against you lol. 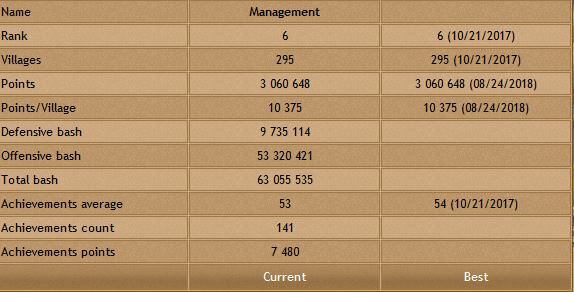 Did you not notice the complete inactivity while you were taking the villages? Or did you actually think you were just that good? lol. You probably did. He is clearly one of the players from back in the days when everyone was cheating .. I know people who did the same. So when I was still playing and you sent trains they got sniped? hm. That's funny. But when I disbanded and deleted my acct... suddenly you were able to take the villages? And you think that's trash talk worthy? lol. Leaving Deva when I did had zero to do with you my friend. I didn't even know who you were. Still don't. Nor do I care. Doubt anyone here really does.. Here are my stats from Leeds Castle, which we won. And here are my stats from San Servando.. also won. Hi, Great White is that you management. If so we didn't fight but I have TeamAnderson3's coop some time, I fought wtih you there. You & Zesh are great players. I'm a stranger from Turkey. I finished in the first place. Let me say that US servers are crazy. 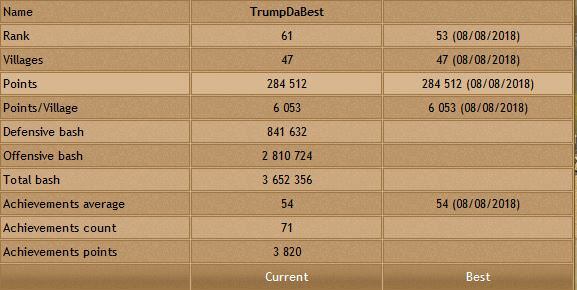 More players than Turkey & Less cheaters. Thats good. I played 7 worlds, 5 turkish, 1 beta, 1 US deva. I think this world is the shortest one. Mostly finished them in top 10. Some of them Top 3. So let me anaylsis this world. % 50 Tribe Brothership & Communication & Hardworking. So yes RIP has a tremendous effect but even so, without leadership diplomacy and hardworking resisting players, we can't win. Thanks all. Thanks mods also. RestInPieces and Management like this. There certainly were plenty of Turkeys in RIP.. you must have felt right at home. Let me analyze this world.. Cause that's all that matters right!?! Don't be sorry for TA3, he is at edge of enemies. I think he was in the most enjoyable position in this game. We defended a few hundred attacks together. I think we did a good job. he didn't restart, lol. It was the defenseless villages against the catapults, but this is the system of the game. A little better work on defense could have been done. With the available defenses, we could only defend 2-3 villages. It is better to smashed down than to be seized. I don't agree the enemy recruitment thing. The enemy of my enemy is my friend. It's a strategy. In real wars, sides also can be change. I dont understand why this kind of trash talking is discouraged. This is what gets me hyped for the game because it increases the stakes and drama for the worlds. Yes but the worlds are short now and the community is small. "Hugging" only kills what little challenge this game still offers. But for some its their only route to success.. Yes fighting TA was fun. He was outmatched but held his ground well. Hmmm there's a thought. Maybe you should try it. Kick them all...kick them all!!! !